Hot Air Ballooning Over Inle Lake: Better than Bagan? When most think of hot air ballooning in Myanmar, pictures of colorful balloons rising up over the temples of Bagan come to mind. As it should... people (and pilots) come from all over the world to experience that glowing sunrise view from above the temples with nearly 1000 years of history to them. But there is a open secret that all of the hot air balloon pilots in Bagan talk about, and that's the hot air balloon flight over Inle Lake. Curious about an adventure to The Golden Land focused on food, festivals and photography? The 2019 dates for the "Un-Tour to Myanmar" in November 2019 will be announced shortly. Join me! Comparing Inle Lake to Bagan, some simple differences emerge. Hot air ballooning at Inle Lake isn't as big of a deal, or at least as high profile. While most mornings from mid-Oct through March you can see upwards of 20 hot air balloons flying across the Bagan plains, at Inle Lake, you might see one... and at most 3. And when you consider the size of the lake, and the valley surrounding it, watching (or photographing) the balloons from below is hardly the spectacle from below... but much like in Bagan, the view from above gives you a whole new perspective on the landscape. A boat heads from the village and past the floating gardens to the lake. The buildings you see here are rest houses for the farmers during the heat of the day. The morning started early with a 5:15am pickup from the guesthouse in Nyaungshwe. From there, we headed by minivan to the jetty where we took a boat to the launch site. The boat ride started slowly as we traveled through canals towards the lake. It was very dark, and the assistant to the driver would shine a bright light ahead every 20 seconds or so. It wasn't so he could see where we were going necessarily, the fog was too thick to see much of anything, but to alert other boats of our presence in the water. Once we made our way to the lake and left the fog behind, we picked up speed. It was chilly to say the least, and the big blankets provided were much appreciated. Depending on the wind direction, there are several launch sites that may be used. In our case we headed down towards Mya Nyi Gone on the western side of the lake, and the journey from Nyaungshwe was about 45-60min. The crew fires up the burners to fill the balloon with hot air. Minutes later, we were in the sky above Inle Lake. On arrival to the village, my guests and I were greeted by our pilot, Nick who brought us behind the monastery where we had docked and toward the village school. Our launch site was the school yard, and here we sat at a small table for a tea and light snack while the crew was preparing the balloon for launch. The sky was getting brighter by the minute, and the excitement building as the burners fired up to further inflate the balloon and prepare for launch. Our flight would essentially be a private one, with three of my Un-Tour to Myanmar guests, my assistant, and I joined by a visiting hot air balloon pilot from Bagan. It couldn't have worked out better. When given the word, we all hopped in the basket and sat down for launch. Moments later at 6:50am we were standing up to see the views as we slowly rose above the village. Immediately, I was already getting a view of the lake that even after 5 years of traveling to Inle, I had never seen before. I could see the villages sprawling from the edges of the valley and into the lake, with canals that looked and acted like veins and arteries, making transportation and life possible. The floating gardens that I had only ever seen at eye level before now looked like hundreds of glowing, furry caterpillars wiggling their way across the lake. The light was amazing and I was smiling while soaking it all up. Our "James Bond-esque" practice landing on the Inle Lake. It was at this time that our pilot Nick let us know that we would be making a practice landing on the water... yes on the water. In the distance, we saw a pair of Inle's famous longboats heading our way, attached together by a small platform. Since you can't steer a hot air balloon (you're at the mercy of the wind), we gently hovered over the lake as the boats moved into position below us. It was a little Batman-like, in that it seemed a bit crazy to be landing a hot air balloon on a lake, but we softly dropped down on the platform that was barely bigger than the basket itself. The staff went quickly went through their tasks, and less than a minute later, we lifted off again. For the next hour and 45min, we floated in the sky, sometimes dropping low over a village or floating garden, and other times lifting higher than the mountain ridges on either side of the valley. You could see the action in and around the lake pick up as the morning went on, and we even got a view of the lively Kaung Daing special 5-day market. A typical flight lasts 45min to an hour, but since you can't steer a hot air balloon, sometimes it might be a little longer as the pilot looks for a safe landing space. Our talented pilot Nick was in frequent contact with his ground crew as he eyed up potential locations before putting us down in a farmer's field north of the lake. It was quite the spectacle to have the green balloon land next to the village, and many people came to see what all of the commotion was about. Capturing the balloon as it begins to deflate often makes for a great shot, and the golden shimmer of the heat plate against the green balloon and blue sky as the vents opened was really photogenic. Our hot air balloon landing site just North of Inle Lake. We landed in the field in the lower-center of the photo. The field our balloon landed in just outside of the village. Watching the hot air balloon deflate as the vents in the top are opened. 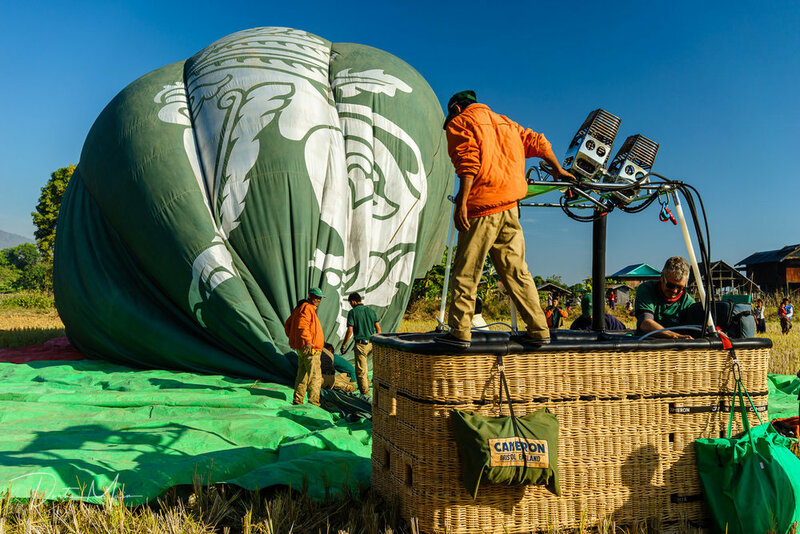 The ground crew begins the process of packing up the hot air balloon and basket before heading back to Nyaungshwe. Meanwhile the ground crew laid out a tarp to protect the balloon as it deflated while we shared some breakfast refreshments, hugs and our WOW moments from the nearly 2 hour flight over one of Myanmar's most beautiful landscapes. In no time, the crew had packed the balloon, basket and gear and a short while later, we all hopped in a van back to Nyaungshwe. Arriving back to the guesthouse a bit before 10am meant that the whole experience was about 4.5hrs from pickup to dropoff. Everyone (including myself) was extremely impressed by the experience, and it ranked among not only the favorite experiences in Myanmar, but also their best travel experiences period. Now that you know what the experience is like, here is some other information about the balloon experience over Inle (and vs Bagan). When can you take a hot air balloon flight over Inle Lake? The season runs from the beginning of "winter" or the dry season, through mid March. Flights take place in the morning, typically launching a few minutes before the sun rises over the mountain, though the pickup from your guesthouse will likely be ~90min earlier. Both balloon companies use smaller baskets (6-8 person) at Inle Lake, which makes for a much more enjoyable experience than the larger 12-16 person baskets that are typically flown in Bagan. In my experience, you're more likely to have a cancellation due to weather in the first half of November. The bright colors of the houses in the floating village, moments before being drenched in the rays of the rising sun. How much does a hot air balloon flight over Inle Lake cost? A hot air balloon flight will cost you between $340 USD (Balloons over Inle) and $399 USD (Oriental Ballooning) in Inle Lake, to Bagan's $315 USD. I would say that for the experience, it's worth it. From that early morning ride across the lake in the dark, getting the first view as the sun peeks over the mountain, and to the golden views of the villages and floating gardens across the lake, it truly is a fantastic experience. With so few balloons and so few spots, it's crucial to book in advance if you want to be guaranteed a spot. Standby tickets may be available, but don't bet on it! If you want to save a few dollars, travel agents like YTT Travel or Peace House offer hot air balloon tickets at a bit of a discount. In the event of a cancellation, your will be fully refunded by the balloon company (or the agent if you purchased through one). Is it safe to take a hot air balloon flight in Myanmar? For sure. All of the pilots for Oriental Ballooning and Balloons Over Bagan are from the west (mostly Europe) and licensed in the UK. They, like many hot air balloon pilots, travel around the world with their families to different countries to fly during each place's respective flying seasons, and many have been flying in Myanmar for years. The balloons and equipment are manufactured in Europe and imported in to Myanmar. Ground crew is highly trained in all aspects of the experience. Flights take place at the best time of year, when the weather itself is the most predictable. If the weather is not perfect, flights are called off. I've had two Inle flights cancelled the morning of the launch even (4:30am) in early November. I've also personally seen balloons launching in Bagan, and when the wind shifted and passed a certain threshold, the other balloons still waiting to launch were grounded. No corners are cut. Shadow of the balloon captured on the floating gardens of Inle Lake. You're going to have to pack light for a hot air balloon flight, as there isn't much room in the basket. Leave your tripods and big bags back at the guesthouse, and bring a single extra lens if you like. Early in the morning before the sun rises, you may need to bump up your ISO to capture enough light while keeping the shutter speed high (1/250 or faster) enough so that you won't get any motion blur, particularly at lower altitudes. Once the sun comes up over the mountain ridge, you'll have some particularly remarkable light for ~15min, so take advantage of it. After that, it gets quite bright, so you'll want to shoot towards the north and west (away from the sun) to get the best colors. Don't forget your lens hood. On my flight over Inle Lake, I had a 35mm and a 70-200mm and mostly used the 35mm. How do I make the most of my experience in a hot air balloon over Inle Lake? Dress warm: It'll be very chilly in the morning on the lake. Blankets are supplied, but wearing warm layers along with gloves and a warm hat will make the difference. In the balloon it may also be a bit cool to start, warming up as the sun gets higher in the sky. Pack light: You'll only be gone for a couple of hours and space is at a premium inside the basket, so leave your bigger bags and things back at the guesthouse. Don't forget your camera! Get a good night's sleep before: It's an early morning wake-up call, so get to bed early. Don't worry about falling asleep during the ride though, there are amazing views all around. Hot Air Balloon over Bagan or Inle Lake: Which should I book? Isn't that the million dollar question? Having flown over Bagan twice and Inle Lake once, I can say that I would absolutely fly over Inle Lake again, while I probably wouldn't bother over Bagan. There is a depth of unique views over the lake that is a little different than Bagan, and I've probably had my fill of Bagan. That said, they are two very different experiences and you can't go wrong with either: it's less about comparing Inle Lake to Bagan and more about expanding the possibilities for enjoyable experiences. If you can't decide, book them both and skip out on the fancy coffees back home for a few months to make up for it. I guarantee that in 20 years, you won't think about those days without a grande in your hand, but those experiences observing Myanmar's beauty from above will continue to bring a smile to your face. An Intha farmer paddles through the rows of floating gardens shortly after sunrise over Inle Lake.